You give the card. They choose a gift they’ll remember forever. 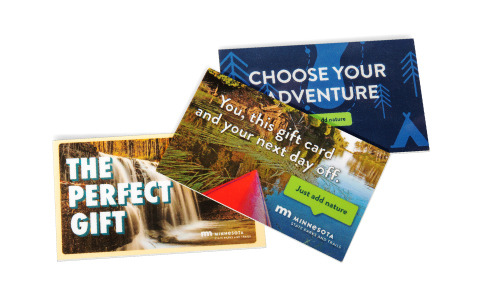 Get all the information on Minnesota State Parks gift cards. The fine print: Gift cards may be redeemed at all state-operated Minnesota state parks retail locations. Gift cards are not valid for concessionaire-operated facilities; hunting, fishing, or other licenses; vehicle/watercraft registrations; or other non-approved DNR fees/services. Gift cards are not redeemable for cash, and Minnesota State Parks is not responsible for replacing lost or stolen cards. Please note the following is your address on file. If requiring a different shipping address, uncheck the box and enter a new shipping address.